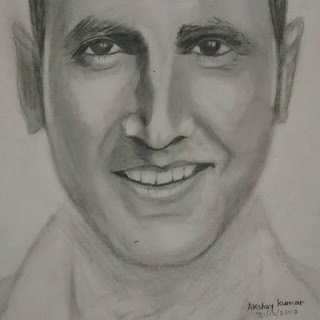 Pencil Drawing sketch portrait of Indian Bollywood's Versatile Actor Akshay Kumar. Akshay Kumar (born Rajiv Hari Om Bhatia) is an Indian-born Canadian actor, Producer, martial artist, stuntman and television personality. In a career spanning more than twenty five years, Kumar has appeared in over a hundred films and has won several awards including the National Film Award for Best Actor for his performance in Ruston and two filmfare Awards. Akshay Kumar has a huge fan following not only in India but in other countries also. He is very active on social media also. Tools used to draw actor Akshay Kumar. HB Pencil - HB pencil is used in this portrait to shade the skin colour. 6B Pencil - 6B pencil is darker than the HB pencil which is used to shade the shadow on the face of akshay kumar. Black Color Pencil - Black color pencil is used in this artwork to shade the darkest area on the face. like the eyes and nose and sides of mouth. Cotton - Cotton is used in this drawing to spread the graphite evenly and to give a smooth look. Eraser - To give the illusion of shining to the face. Sharpener - Sharpener is required to sharpen the pencil.